This past week I signed up for Educators 2 Educators Teacher New Year Reboot Conference. While there was a lot of great information available at this conference, the thing I wanted to see more than anything was The Life-Changing Magic of Tidying Up Your Classroom from Building Book Love. I'd previously read Marie Kondo's book, but had never thought about applying it to my classroom before. I've been feeling stressed lately about the size of my room, and the lack of storage and wall space, so seeing BBL's post on Instagram seemed serendipitous. 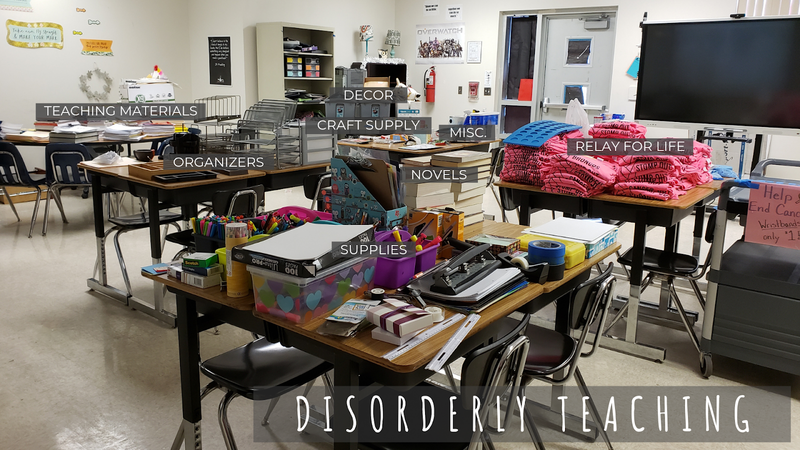 When I watched her presentation, the number one thing that stood out to me was the concept of taking EVERYTHING out and then figuring out how to organize things. 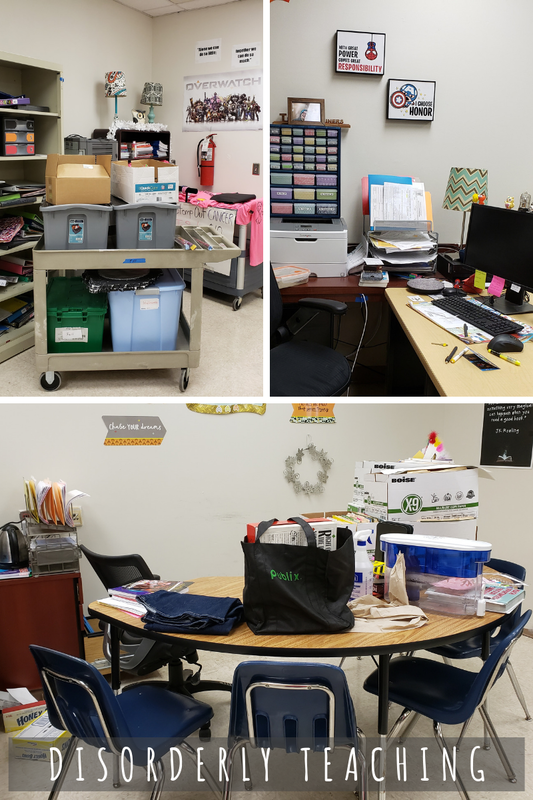 I had been trying to organize around the things I had already stored, even though those things had been put away haphazardly in a rush at the beginning of the year and where they were placed really made no sense. No wonder I wasn't making any progress! Feeling super energized and optimistic, I decided to commit my entire teacher planning day after Winter Break to this challenge. If you're interested in doing the same in your room, I highly recommend you join Building Book Love's Life-changing Magic of Tidying Up Your Classroom FREE 7 Day Challenge. A quick snapshot of what me room looked like daily. Despite my enthusiasm, it took a little effort to get going. What can I say? Coming back to work after two weeks and hitting the ground running is a little rough. Still, I eventually did start pulling out all of my belongings and stacking them on the desks in the middle of my room. The only things I left in place were student binders and notebooks, because I knew I wanted them to stay where they were. EVERYTHING else came out. EVERYTHING. It was kind of exhausting removing items from every corner of the room, but it also felt really good to take stock of what I had. In the 7 years I've been teaching I've been through 4 subject areas, 4 classrooms, and combined with a co-teacher with 25 years experience. So while I had a lot of the usual clutter of supplies and materials, I also had a ton of off miscellaneous items around. I honestly could not have told you half of what was in my room. But with everything pulled out and categorized, things didn't seem so bleak. I realized I had a fair amount of space to store things on shelves if I organized properly, and I had more wall space available once the boxes and bins were out of the way. "I have an empty cabinet this can probably all fit in." BAM! Big cart, 3 shelves, and 3 filing cabinet drawers were freed! Talk about magic! Next I went into my miscellaneous pile. I knew some of it would be tricky to sort and organize, but there was also clearly a lot that I simply did not need. With ruthless precision I yanked out anything I knew right away was unnecessary and started a give away pile. I also started a return pile because, apparently, I had things that belonged to a number of other people. Once the pile had grown too big to fit on one desk, I bagged it up and brought it to our planning room and put it on display. Another sigh of relief. I could finally breathe in my classroom. I boxed up the rest of the miscellaneous items to deal with another day, then moved on to my novels. I realized just how few I had actually taken to my new room. I stacked them on my nicest bookshelf and planned to get more books from storage. Looking around the room I started to see things I hadn't before. My Harry Potter posters, as much as I loved them, did not match my Superhero theme, so them came down. I had highlighters stored in three different places. They were all combined into one container. I HATED the sliding draw organizers I used because of course adding an extra level in my desk drawers made sense. Who wouldn't want more room? Except they slid around, blocked access to the other materials in the drawer, and they were ugly. Now I had the clarity to let them go. Near the end of the day I found myself looking back to my desk area repeatedly. There was nothing inherently wrong with it, but it definitely did NOT "spark joy" as Marie Kondo would recommend. 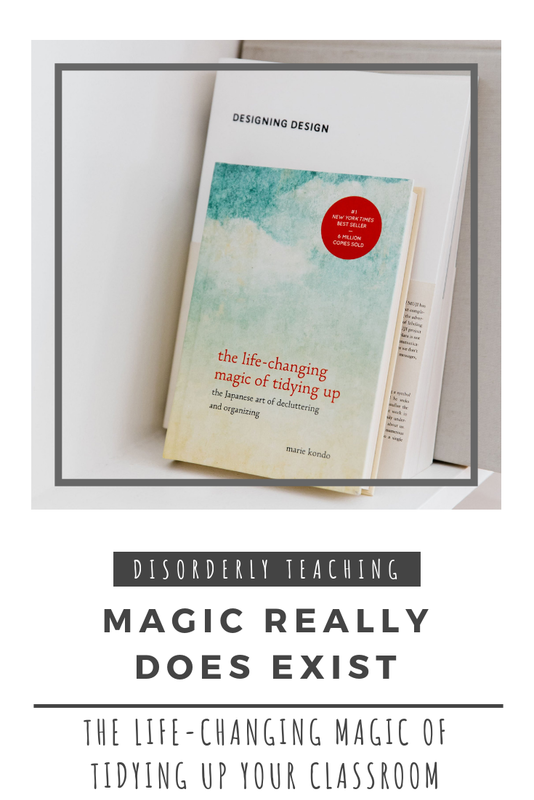 It felt cramp and cluttered, and despite having a rack organizer, desk drawers, and a 2 drawer filing cabinet, I was constantly stacking papers on random corners and over my printer until I could get to them. It simply wasn't working. So I yanked out my desk. I didn't even like it to begin with. It's metal, and it doesn't watch the wood of my shelves or the build in shelf that holds the room's electronics. I had made do with it because it was all I had, but after tidying everything else, I felt ready to try removing it completely! It didn't work. Or rather, removing my desk and shifting my computer to the side counter didn't work, because then I would be putting my back to the room any time I took attendance or loaded a presentation. No bueno. Still, removing that desk had felt so good, I simply refused to put it back. After playing around with a number of ideas, I condensed two of the student computers to one table, and dragged the other table over. I tried it in a few spots and finally placed it in a spot that DID spark joy. With only a few minutes before I would have to leave for my doctorate classes, I rewired my computer, not even caring that the wires were in a cluttered pile. Somehow it still felt better than my old desk and it's hidden wires ever had. Several students came in the next day and commented on how much bigger the room looks and how open it is! I really expected them to be chiding me about the massive pile of things I had waiting on our small group table but I guess the overall effect of my tidying and rearranging overrode that. Their enthusiasm gave me the energy to push through a 12 hour day the next day. Don't ask me what took so long. I guess I never realized with a cool platform Instagram is for teachers. It's like Pinterest and Facebook with mashed together and I'm totally digging it. So during my Master's program, one of my professor's, Dr. Scott, had us use a technique known as SAFMEDS to learn new vocabulary. It's an ABA method and it was an ABA class so it made sense to give us practical experience using it. Say All Fast, Minute Every Day, Shuffled. 1. Take your set of vocabulary cards (typically 30) and shuffle them. 2. Hold the cards with the definition facing you. 3. Set a timer for one minute. Say the word out loud. Flip the card over to check if you were right. Stack the cards into correct and incorrect piles. 5. After the minute is over, stop. No cheating because you're only cheating yourself! 6. Count how many words you got correct and incorrect. Your goal is to be able to do 30 words correctly with 0 incorrect in one minute. Mark your number of corrects with a dot, and your number of incorrects with an x. Any cards you did not get to should count as incorrect. So if you got 17 correct, 4 incorrect, and still had 9 in your hand, you would chart 17 correct and 13 incorrect. This is typically charted on a Standard Celleration Chart. 9. Watch your corrects go up and your incorrects go down. Now this information may be useful to you personally - maybe you're taking classes or studying a foreign language - but when I saw how effective this technique was, my first thought was how I could use it with my high school students. My students struggle with vocabulary. Like review it five ways, finally get it right, and forget it two minutes later struggle. A lot of them have learning disabilities and language impairments, so the struggle is real. From the get-go they have trouble retaining vocabulary knowledge. On top of that I've found that they genuinely do not know how to study. They may want to study but they literally do not know how because they've never been taught. Maybe they've heard of or seen flashcards, but they don't know what to do with them. You might think I'm exaggerating - after all these kids are in high school - but I can't tell you how many of my student wrote their vocabulary words and definitions together on one side of the card, or wrote multiple words on each card. So yes, they needed this. And I gave it to them. I'm not going to say that the day they walked in to me smiling way too much, packs of index card in my hands, they were jumping for joy at the idea of making flashcards. In fact they hated it. How could I possibly make them write so much?! Why did they each have to make a set? What was the point of it all? Why does the universe exist? But I made them do it. And it worked. Of course I couldn't just give my students the instructions I gave you above and leave them to it. First I had to consider how I may need to adapt this for my kids. Most of them get 100% extended time on their tests and assignments, so I needed to adjust their fluency target. The standard goal is to do 30 words in one minute. In order to provide 100% extended time, I would have to change this in one of two ways: either they could do 30 words in 2 minutes, or 15 words in 1 minute. My students often shut down and won't try if something seems too challenging, so I opted for 15 words in 1 minute. I also needed to change the chart I would use. The Standard Celleration Chart is an amazing tool, but I knew my student's would never need a chart that went into the 100s. On top of that, one you hit 5 or 10 on the chart, the acceleration of the growth line (basically how sharply it goes up) drops significantly. I felt this would be discouraging to my students who would likely be starting around that point. The chart can also be confusing to look at and complete, and is visually cluttered. I ended up making a very simple chart for my students to use. We still used dots for corrects and x's for incorrects and even that was confusing for my kiddos so I'm definitely glad I made this change. Finally, I needed to ease them into using SAFMEDS. Rather than starting them off with a full set of 30 words, we started with 11 words they had already been exposed to in our figurative language unit. I figured this would allow them a chance to practice the mechanics of this strategy without having to learn new words at the same time. It would also increases their chances of early success (and resulting buy in) since they had a head start on learning the words and they would only have to do 11 in a minute to get a 100 on their vocabulary grade. SAFMEDS is now part of our routine. At the start of every class I have a timer displayed on the projector, cueing my kiddos to get their flashcards out. Once everyone is settled I start the timer and they all go through their cards. After the timer is up, they fill out their graphs. For grading, on Wordy Wednesday, I call the students up to me one by one and have them go through SAFMEDS at my desk, while the rest of the class completes independent work. I then give them a quiz grade based on their total corrects divided by their target. If a student does really poorly they can retake it once more after everyone else has gone, or during lunch. Doing their quizzes this way takes more time, but I really like the one-on-one time it gives me with them and I get a far better understanding of their knowledge, confidence, and study habits than I would with a traditional quiz. On Thursdays they are assigned 5 new words which they add to their stack. Gradually we are building up their vocabulary set, and they are continually exposed to all of their words. *For students on Access Points, IND Curriculum etc, I increase the time to 2 minutes. *If a student is processing really slowly but getting the words right, I let them keep going after the timer and give them the option of grading based on corrects divided by total cards instead. I wish I could say I took data on their vocabulary learning prior to implementing SAFMEDS and could therefore statistically show their improvement after learning the strategy. Unfortunately I can't. My student were excited to see their progress lines go up and would call me over to show me their graphs. When was the last time you saw high schools excited over vocabulary? They were analyzing their graphs. If they noticed their corrects weren't going up as fast, or that they plateaued, they were trying to figure out why and trying new techniques to improve. I've seen kids who never speak to each other offering encouragement and studying together. Some of my kids challenge each other on Wednesdays to see who will get the top score and or go through all of their cards the fastest. Sometimes kids will gather around my desk to cheer for the person taking their quiz. Students have told me they now use SAFMEDS for vocabulary in other classes. I no longer stress about vocabulary instruction. So that's about it. 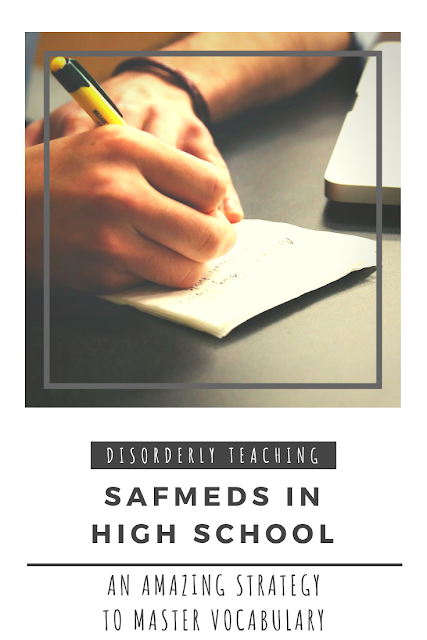 I hope I've done an adequate job explaining SAFMEDS and how useful it can be in the classroom. If not, please let me know and I will post an update! If you use SAFMEDS, let me know how it goes! Just a quick post to share a cool tool I've found reduces the noise level in my room. Okay, so have y'all heard of the site Ambient-Mixer? It's a website where you can combine 100's of different ambient noises including sound effects and music, in order to make the perfect background noise for whatever you need. I first heard about it because people were using it to make really cool "audio atmospheres" based on books and TV shows, like "Gryffindor Common Room," "Neverland," and "Sherlock's Apartment." Being an uber-nerd, I created a mix for the Hufflepuff Common Room and I listen to it all the time when studying or doing homework. It wasn't until this year that I decided to try using Ambient-Mixer in my classroom. I sometimes play PrimeMusic at a low volume when my students are doing independent work to limit their talking, but it was presenting some issues. I kept getting requests from kids to change the song or play sometimes specific, and music with lyrics could be distracting. So one day I decided to pull up Ambient-Mixer and give it a try. After some complaints and arguing over what to listen to ("No not rain, it will make me have to pee!" "Miss what is this? I don't need to feel like some animal is gonna come eat me!" "Okay that weird giggling is creepy!") we found a mix the class liked overall and they got to work. And they were quiet. I think they all were silent at first so they could listen to the sounds a bit. Then they got into the groove of working and stayed quiet. Not perfectly silent mind you, but far quieter than usual. It was beautiful. So now I give my kids the option of silence, music, or ambiance. When they want the ambiance I sometimes let the class or one student choose what to listen to. You'd be surprised what they come up with. Mostly it's typical things like rain, bonfire, or a storm. But I've had kids challenge me like "I want to be in New York City," or "Let's be on a pirate ship." A great thing about the site is that you can edit anything you open. I often adjust the sounds for the first few minutes until it's a nice balance, lowering the volume of anything too loud or sharp, and sometimes muting really distracting sounds (sorry calling deer in the forest. You make it sound like we have a cow in the room). Beyond just background noise, you can use Ambient Mixer to add some atmosphere during readings. I've got a fairy forest mix we use for A Midsummer Night's Dream, and I'll pull things like Marketplace or Dance Hall when reading Romeo and Juliet. And you can make your own. The possibilities there are endless. Custom design sounds for your class, certain activities, or stories. You can even have the kids make some themselves. 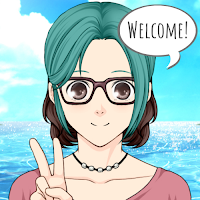 It's a really cool tool and I hope you try it out. So remember how I said I was finishing school and would be able to finally breathe and focus on other things like this blog again? One of my professor's recommended me for my universities Doctoral program in Special Education and said I should meet with the department chair. At first I said no I can't right now, but then I realized I could be passing up a good opportunity. When else would I have an "in" like this? So I met with the chair. And he liked me and told me to apply. So I applied. And did my formal interview. And they accepted me less than an hour later. And now I'm back in school again. But I'm not giving up on Disorderly Teaching! My goal over the next few weeks is to revamp the layout and graphics here and try to get posting again after that, so bear with me. You may have noticed that this blog went dark for quite a while. The truth is that the past few months have been incredibly difficult. I've been overloaded with keeping on top of work, my Master's classes, and my home life. Lack of sleep and self-care have left me exhausted and some things had to be dropped. This blog was one of them. But! There is light at the end of the tunnel. I am in my final semester of school and once that's done I can't wait to come back here and start sharing with you all again. Sorry to keep you waiting, but I'll see you soon! OMG. It is now late October, meaning school has been in session for two months (minus a week and a half for Hurricane Irma) and I still feel like it's the first week of school. My classes are not following solid routines, my lesson plans are all but nonexistent, and I feel like I'm running myself ragged but not actually teaching anything. So I've decided to scrap all I have established (and established is a strong word. More like half-heartedly follow every other day) and do a mental reset. I'm basically going to start teaching as if it's the first day of school again. Teach class rules, routines, procedures. Establish regular assignments, grading categories. Everything. Because what I'm doing now is not working, and I can't keep pushing through because I'm afraid to go against the flow and try to reset.